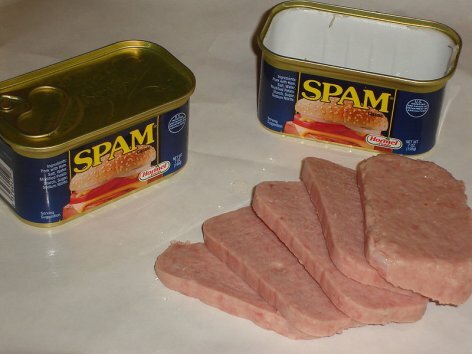 SPAM, a canned meat product and a very annoying form of advertisement. As anyone who has a blog knows, one of the nuisances associated with blogging is the spammers. They have automated programs that find blogs and then leave “comments” that essentially advertise something. Of course, most bloggers use some sort of anti-spam software to keep the spammers at bay, but no such software is perfect. The software I use, Akismet, is pretty good, but every once in a while, it misidentifies a real comment as spam. Since I don’t want to lose any real comments, I go through the spam folder from time to time. HELP! I’m currently being held prisoner by the Russian mafia (link) and being forced to post spam comments on blogs and forums! If you don’t approve this they will kill me. (link) They’re coming back now. Please send help! I think spammers are probably the lowest form of life, or at least they are giving politicians a good run for that position. Nevertheless, I think I could come to like the spammer who thought up that one! Ha, that’s a great one! They are quite an odd, desperate bunch of people. One such spammer asked me to marry him once. I left his proposal in my Akismet bin. haha wow! desperate much i think 😀 my mom and sisters gotta laugh outta that. This will help slow the flow and is right up your intellectual alley! thchipmunk, that might be just what I am looking for. Thanks! I have seen these at more and more sites recently. There are others that ask a question such as “Click the picture of the cat” and will show pictures of a cat, dog, frog, and baby or variations thereof. I personally like them more than CAPTCHAs because of the fact that they rely more on human intelligence than they do on reading fuzzy/warped words which can present problems. I understand that the CAPTCHAs are better because they can be computer generated from an effectively endless supply of words, whereas pictures of babies, cats, dogs, etc can’t. Those math things are interesting, but I wouldn’t trust them too much either, since computers and math sort of go together. Perhaps at some point we’ll get squiggly pictures of a mathematical equations. For right now, I am still just going through the SPAM bucket.